Meet Blue Coat Chef Berry. 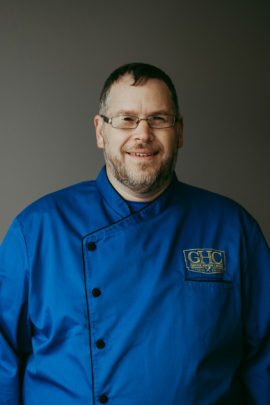 He has been a valued member of the Blue Coat Army since 2016.Berry has completed a 3–year apprenticeship with the American Culinary Federation among other culinary education. Berry has also learned a lot from his favorite chefs Julia Child, Matty Matheson, and Anthony Bourdain. He loves to cook Mediterranean food and also has experience in Italian cuisine. Berry’s favorite thing about working for GHC is the family/work life balance it brings and being able to get direct feedback every night from his house. Berry loves indulging in a great Pho dish and watching soccer any chance he gets. Next time you see Chef Berry ask him about the best dish he ever ate while living in Okinawa, Japan for two years! He has some great stories he would love to tell you about.